When World War II broke out, Jünger — only in his mid-40s — loyally rejoined his old company, but was eventually assigned a desk job in Paris, where he pushed papers and, more importantly, kept a journal. 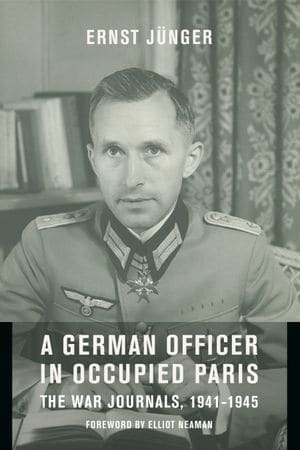 This last has finally been expertly translated into English by Thomas and Abby Hansen as “A German Officer in Occupied Paris” with an excellent biographical-critical foreword by Elliot Y. Neaman. Many of his lunchtime walks take Jünger to the city’s print dealers and antiquarian booksellers — “oases in a world of carnage.” He reads widely: Pliny’s letters and a glossary of medieval Latin, a biography of the Brontë sisters, the essays of Léon Bloy and Joseph Conrad’s “Heart of Darkness.” At bedtime he gradually makes his way through the Bible twice. When the war finally ends, Jünger’s life is, astonishingly, only half over — he would live to be 102, dying in 1998. Some critics argue that his transcendental-mystical bent tends to aestheticize horror and suffering, which to some extent it certainly does. Still, Jünger himself deserves to be honored as a serious, if morally and politically complicated, European humanist.